Wednesday was Tab's birthday. Every year since 2000 I've given her the same gift. I go through the hundreds of prints I've made in the past year of her and our 3 sons, select the best ones, and put them into small black books. This year there were 5, one for each kid, one for her, and one of photos featuring several family members. Even though they are never a surprise, Tab loves these gifts. I do too. Many of the photos are my personal favorites not just of my family but of all the photos I've taken in the past year period. I think this is because I have a very high comfort zone shooting my family. I always have a camera, they are used to being photographed, and so the photographs have none of the self-consciousness which sometimes restricts my street photography. Beyond this is the fact that these photos are very time specific. Kids grow quickly. I can look at my books from just a few years ago and the kids look so different they may as well be aliens. In 20 or 50 years this will be even more true, and these books hopefully will be something they can treasure at that point in life. Since moving to Eugene probably half of all the photos I shoot are of my family, and they form a large portion of what I consider my important photographs. Which brings up a question a friend asked the other day: "Why don't you have any photos of your kids on your website?" The corollary is "Why don't you show and/or sell those photos?" My guess is that most photographers have asked themselves a similar question, with varying answers. Since most people wind up having kids at some point and photographers are no exception, most photographers have photos of their own children. The decision to make these photographs public is a separate one. When you consider the long tradition of photography, the number of photographers who've chosen to include their children in their public ouvre is rather small. Erik and Anna turn up in many of Friedlander's photos, Nixon has shown us Sam and Clementine, Weston took many photos of all three sons at various points (it's interesting that he chose to behead his most provocative child photo --the shot of Neil's torso-- thus making it anonymous). Gowin, Callahan, Frank, and Erwitt have shown us glimpses of their children, probably because for this group there was not much separation between photography and life. More recently, Tina Barney,Todd Deutsch, and Donna Schwartz have used their families as the basis of substantial bodies of work. But these are the minority. For most photographers we have no idea what their kids look like, and I have to believe that lack of knowledge is due to a conscious decision toward privacy by most photographers. There is one photographer I haven't mentioned yet who overshadows this entire discussion. If you are a photographer you are thinking of her right now. Her children are so central to her work that I don't even need to mention her name. 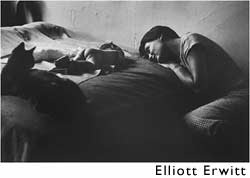 Her photographs of Emmett, Jessie, and Virginia are so engrained in photographic history that they almost feel like our children as much as hers. Just this week I found a book at the U of O library which felt a lot like Immediate Family. 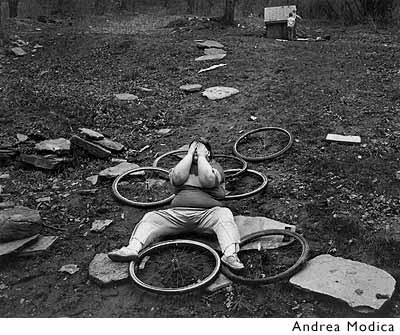 It's called Treadwell by Andrea Modica. It's a great book. The similarities are unavoidable. 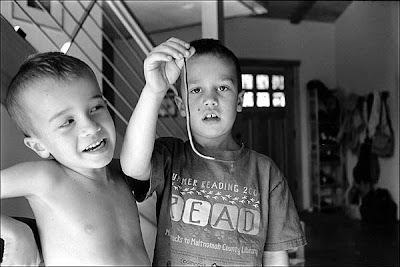 Large format black and white photos of kids in a small backwoodsy environment, with a heavy dose of strangeness/sadness and innocence lost. As in Immediate Family there are a few central figures whose portraits at different ages recur through the book, giving both books a sort of narrative quality. The main difference is that the photos aren't of Modica's kids, and for some reason that knowledge casts the whole project in a different light. When I look at Immediate Family I see great photos but I'm also thinking, "Wow! She's showing us this much of her life?" It's a very intimate glance. For Modica I see great photos but it doesn't feel as voyeuristic. I'm curious how she gained access to some of the shots but she is showing me less about herself. So why not show my own kid photos publicly? In fact I did show photos of my kids once, at a group show at Newspace in 2006, but that was the exception that proved the rule. For the most part I've kept them out of public viewing. Aside from the obvious reason that some of these photos show sensitive material (my naked kids) which I don't want circulating beyond my control on the web, the main reason is that I don't have permission from the kids. Sure they would say yes if I asked them but really they are too young to decide whether or not they want their images out in the world, and making that decision for them doesn't feel right. Of course by similar logic a large part of my work would seem taboo. I shoot strangers all the time, often posting them on the web or in shows without their permission. But to me that is slightly different. Anyone who goes out in public by that act acknowledges they are taking part in civil society, which includes the possibility of being photographed. Call me biased but I am less worried about infringing on the privacy rights of strangers than on the the rights of my kids. Soon the decision won't be mine. My 6 year old has already begun to demand, "Dad! Stop taking my picture! ", a request I'm sure every photographer and many parents have heard on occasion.